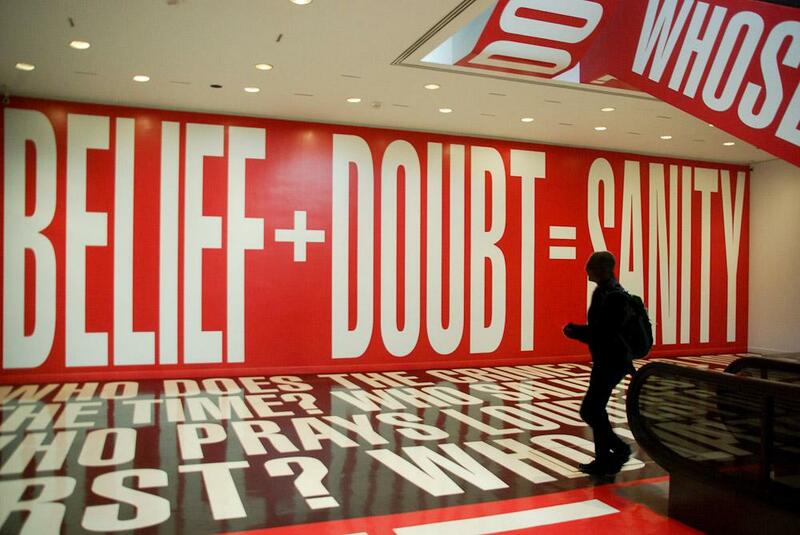 Barbara Kruger’s Belief + Doubt, a long-term exhibition at the Hirshhorn Museum and Sculpture Garden in Washington D.C., explores the themes of power, faith, consumerism, and desire through large-scale textual adages. Vinyl sheeting printed in Kruger’s characteristic red, black, and white boldly display open-ended axioms, prompting viewers to internalize, question, and dispute deceivingly simple phrases. Belief + Doubt represents a site-specific work, not only through the vinyl sheeting that climbs and envelops the building’s architecture, but also through the strategic placement of the exhibit within the Hirshhorn gift shop and, more broadly, within the Nation’s capital. Kruger’s work reinterprets the role of the museum in modern society, directly addressing and involving the spectator in an environment traditionally reserved for passive observation. Barbara Kruger gained notoriety in the 1980s through constructed collages that juxtapose incisive and implicative phrases atop mass-produced and circulated imagery. Works such as Your Gaze Hits the Side of My Face (1982), We Won’t Play Nature to Your Culture (1983), and Untitled (Your Body is a Battle Ground) (1989) explore cultural limitations such as objectification and gender inequality. These earlier works utilize seemingly innocuous appropriated imagery yet encouraged critical thought and questioning through the overlay of subversive phrases. In Your Gaze Hits the Side of My Face, Kruger presents a female bust yet undermines the statue’s inherent perfection by specifying that the female is objectified and silenced by the aggressive “male gaze.” Through the interplay between media imagery and text, Kruger addresses and scrutinizes feminist politics, male projections, and power while simultaneously demanding the viewer’s’ awareness, whether through concurrence or uncertainty. Kruger’s use of textual language to implicate the viewer acts as an antecedent to the singular and interrogative power of the bold maxims of Belief + Doubt. Kruger’s work at the Hirshhorn presents a subtle evolution of the artist’s earlier works at the Lever House in Midtown Manhattan and the Whitney Museum’s future site in Lower Manhattan. Kruger’s 2009 installation at the Lever House, entitled “Between Being Born and Dying,” similarly employed vinyl sheeting to wrap the exterior and interior of the tower’s lobby. Provocative phrases in Kruger’s characteristic white and black tones likewise sought to spark internal dispute, conflict, and understanding through visually and physically overwhelming lettering. At Kruger’s installation at the Whitney, the equation, “BELIEF + DOUBT = SANITY” was etched prominently atop three trailers, an equation that later acts as the namesake for the Hirshhorn exhibit. However, Kruger’s earlier site-specific works in Manhattan lacked substantive aura due to the highly transparent and open nature of the chosen sites; spectators were able to view and internalize Kruger’s adages without subjecting themselves to the inescapable visual environments. Thus, Kruger’s phrasing lacked force and ultimately failed to create environments that acted as platforms for introspective and discussion. While Kruger’s earlier installations utilized materials, phrases, and dimensions similar to those exhibited at the Hirshhorn, these preludial works failed to fabricate a suggestive and ineluctable environment due to the lack of locational context. Belief + Doubt, staged in the lower lobby of the Hirshhorn, constitutes the fruition of Kruger’s endeavors to create a thoroughly immersive and analytical environment. Riding the escalator down to the lower lobby, spectators are confronted with Kruger’s statements and questions. The equation “BELIEF + DOUBT = SANITY” is visible immediately upon exiting the escalator and reaffirms the precarious balance spectators must maintain between loyally internalizing and skeptically rebuffing Kruger’s axioms. Establishing a connection with the Hirshhorn’s location in Washington D.C., Kruger poses questions that explore power structures and politics. Phrases declaring, “WHOSE POWER?” “WHOSE VALUES?” and “MONEY MAKES MONEY” seek to detonate a reactionary response, either through allegiance or doubt. Commenting on faith and justice, Kruger questions, “WHO PRAYS LOUDEST?” “WHO DOES THE CRIME?” and “WHO DOES THE TIME?” Kruger’s declarative statements, affixed to the lobby’s walls and floors in 12ft lettering, produce a hectic environment where the spectator, twisting and turning to read the multi-planar statements, is directly engaged and implicated. Kruger’s work utilizes the lower lobby space and adjacent gift shop to examine consumer culture and desire. Checkered across the gift shop floor, phrases such as “BUY IT” “FORGET IT” “HOW MUCH” and “HATE IT” are juxtaposed against black and white prints of eyes. These textual and visual representations of shallow consumerism provide an analysis of desire, guilt, regret, and greed. As stated elsewhere in the exhibit, “YOU WANT IT. YOU BUY IT. YOU FORGET IT.” The dialogue regarding consumer culture presents itself as an evolution of Kruger’ 1987 work, I Shop Therefore I Am. As with the artist’s earlier work, Belief + Doubt criticizes the act of consciously forging an identity through material goods. And yet, Kruger’s exhibit is imbued with subtle examples of humor and wit. A small smiley face emoticon denotes the location of the restrooms. A Malcolm X quote stating, “Give your brain as much attention as you do your hair and you’ll be a thousand times better off” provides a biting commentary on vanity and intelligence.